The social areas of Selina are very good. I like the way in which they decorate and the atmosphere of the different places in the common areas. The internet connection is fair for those who want to work and travel, like myself. You also have the cowering space which is great if you are a digital nomad :) Staff was... ok. Very cool vibe in a great location. Lovely staff, great restaurant and cafe. The hostel itself is nice and modern, however the building is massive and makes it hard to meet people as a solo traveller. The location was awesome, and the room was very nice - much bigger than we had anticipated. They have artwork everywhere and a nice coworking space. Very comfortable private rooms and since I was there over New Year's the hostel was full and it was easy to meet people. The café in the lobby is really good and they neighbourhood is nice. They have a very big common kitchen and a movie room too. The Staff was nice and everything was kept clean. 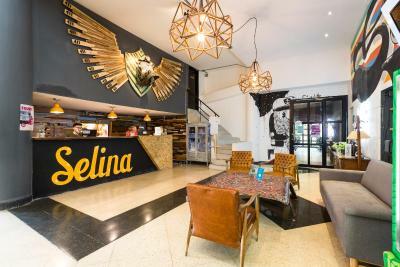 The hostel Selina is located in the "Gringo district" Publado in Medellin... the best area for tourists to go out for Eating, Drinking or Partying. The hostel itself offers many activities and parties - it's not necessary to leave the place - the party is coming directly to you. It's nice to have a shared kitchen if you are up to cook your on meals (or just reheat the remainings of the dinner from last night). Clean, centrally located, and lives up to Selina expectations. One of our top picks in Medellín.Selina Medellin is located in Medellín and has a terrace and a shared lounge. Among the facilities of this property are a restaurant, a 24-hour front desk and a shared kitchen, along with free WiFi. Guests can use a bar. You can play ping pong at Selina Medellin, and bike rental is available. 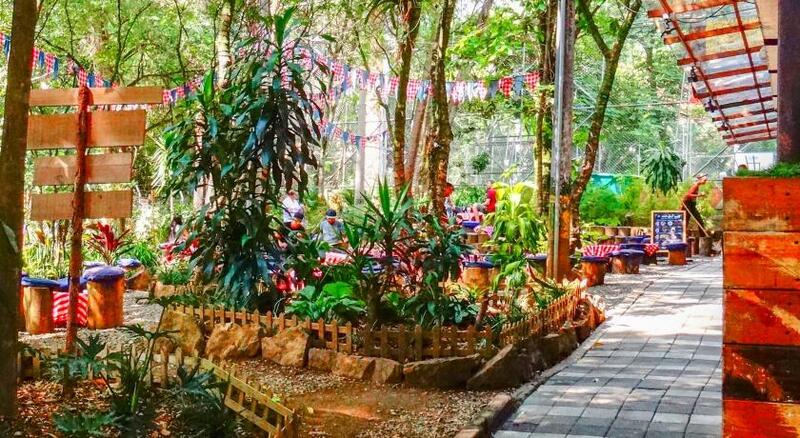 Lleras Park is a 10-minute walk from the accommodation, while El Poblado Park is 0.7 miles from the property. The nearest airport is Olaya Herrera Airport, 2 miles from the property. When would you like to stay at Selina Medellin? House Rules Selina Medellin takes special requests – add in the next step! Selina Medellin accepts these cards and reserves the right to temporarily hold an amount prior to arrival. I rented a private room and it was like a cubicle... or a closet. Not really what is shown in the website, as they show spacious private rooms. This one has no windows, places to put your stuff or anything really. Barely a bed and four walls immediately after the bed (which was almost mattress in the floor). Scarcely your luggage could fit. Very claustrophobic space. For the value you pay I was expecting something way better. Then I passed to a dorm (6 beds). This was ok for the money. At least it had windows so it was way more fresh that the expensive private room. Nevertheless, the beds did not have curtains like shown in the pictures... this did not surprised me after staying in the little closet-like private room. If the 6 bed dorm did not had curtains (which is the most expensive one)... I doubt the others do. Too loud. If you want to sleep this is not the place! The keys work for different doors. No security. We were sleeping in our room and in the middle of the night a guy opened the doors with his key. Selina in Bogota is so much better. Everything that wasen‘t the usual process was a problem and the stuff was not trying to help. Mould in the shower. Beds are shaking a lot when one person is moving. Just too big. No lights on each bed. Bathroom in the mixed dorm was not possible to lock. Other hostels offer for the same price, free spanish and salsa classes with an rooftop terrace. Our private room was very noisy. The bed was on the floor and barely big enough to fit our bags in the room. The Shared WC was not well maintained. This hostel feels more like a big hotel. There is not much interaction with other guests, most of the guests are staring at their phone or are working on their laptop. If you’re looking for a more personal /warm type of hostel, this is not your place. Same goes for the staff, they are friendly but not very warm. You feel a bit like a number instead of welcomed. We stayed in the deluxe room, which was beautifully designed and has a great shower and bed. But be aware: at first they placed us in another “deluxe” room which was far smaller and didn’t have A-C. The location is good: near nice restaurants and clubs in Poblado. Unfortunately, from our room (or the entire building? ), we could hear at night the concerts or Dj parties that were taking place in the lower level of the building - belinging to Selina. Not so good if you want to sleep. The room smell, the noise, it was dirty, dark... well not what I expected. Small, noisy room, dirty (fleece)blanket without sheet to sleep under. Other option room was without windows. Helpful staff even when they were so busy with huge volume of guests. Huge complex, good location, comfortable bed with bathroom off room. Bunk light and charging. Good lockers. Many areas to socialise and great kitchen facilities. Onsite cafe had lovely breakfast and coffee. Room quiet with fan. Lifts in building. I had a private room, which was a bit small and had no window and no proper ventilation. The place was very noisy because there are so many people staying in this hostel. I was woken up by loud Spanish speaking people every day between 6 and 7 am. Some bathrooms weren't that nice, water not draining well. The place is located perfectly with lots of stuff in walking distance. There is lots of stuff to do in the Hostel, with a nice restaurant and bar.